This article is written base on a beta version at Gamescom 2014. The pictures are mostly in German since I played on German computers. Some translations might not match with the English version. 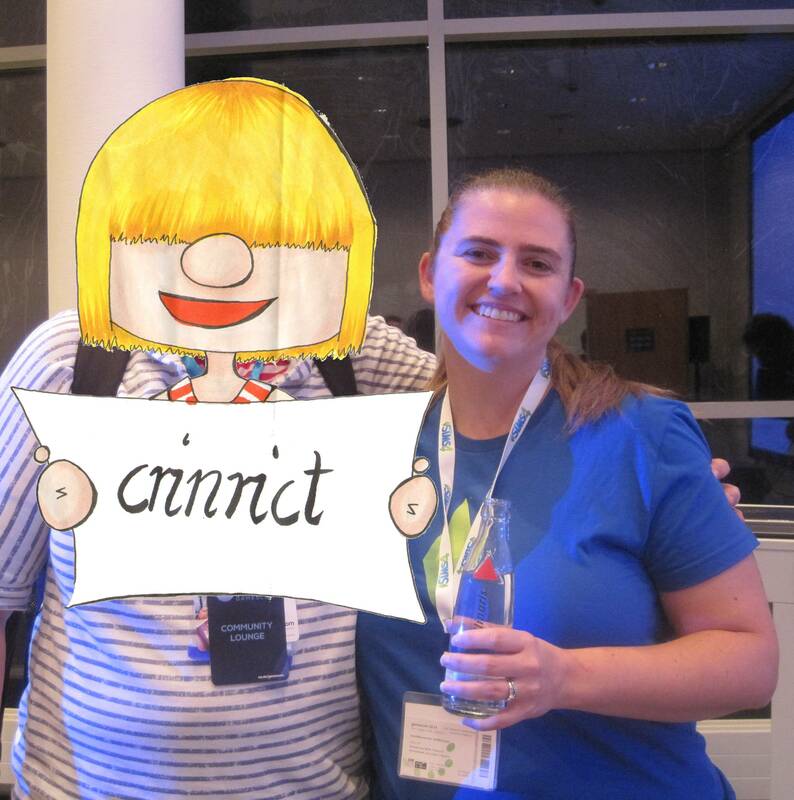 I was invited by EA Germany to attend Gamescom like the two years before. I like to say thank you for the opportunity again. I had a lot of fun and it’s always great to meet the other community members to talk and catch up. 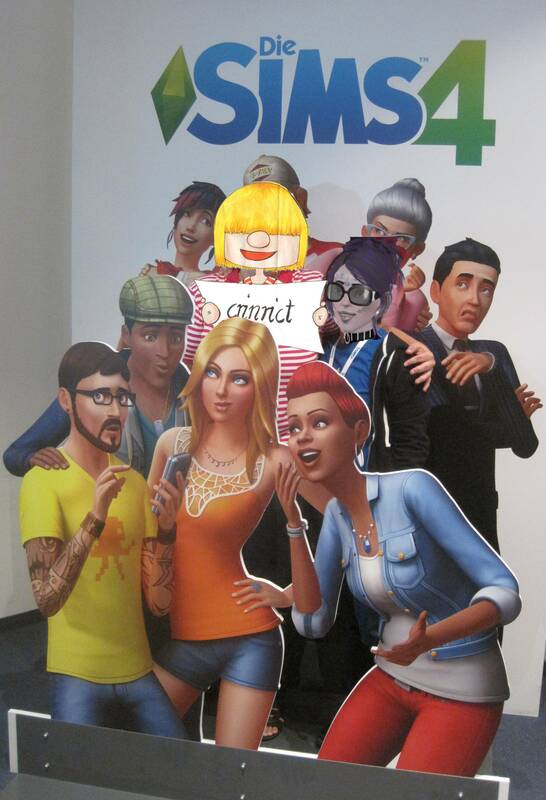 Next to the convention itself, I also had access to the EA Community Lounge and had the opportunity to play Sims 4 myself. Everyone had a slot to play the game for two hours. Since it wasn’t forbidden to watch over each others shoulders or to use an empty computer if that wasn’t taken, I was able to play for 6h (3x2h). I also enjoyed watching others, especially since everyone has their own way of playing. 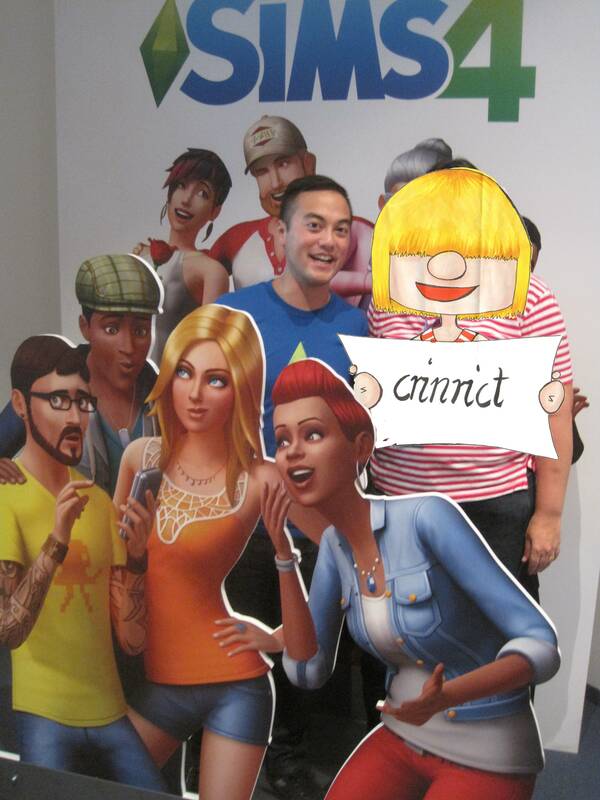 King Choi and SimGuruHydra were also at the lounge, ready to answer our questions. I did not have the time to check out every area of the game but I’m linking some other reports where you can read more. They are mostly in German since Gamescom Community Lounge is mostly about the German Fan Base. I did mostly play live mode but also took a quick look at CAS. Taking screen shots in CAS didn’t work with the Gamescom version. I only took a quick look at CAS to see what’s in the Game that isn’t in the Demo and while the extra selection of hair styles is rather limited, I could find quite some clothing and accessory which are not in the Demo. There’s were also kids, teens, adults and elders of course. If you wanna know more about CAS, you can try it yourself by downloading the Sims 4 CAS Demo for free or you can read my reports here: Sims 4 CAS Demo: Technical Stuff, The Gallery and Sims 4 CAS Demo: My Impressions. Buy/Build mode is very different. Buy and Build mode are much more integrated now and you an find objects with the new search feature very fast. Objects in buy mode can still be sorted by room and function. Residential lots can be given a name and you can enter information about the number of beds and bathrooms. This information is purely for the gallery though since it’s no problem to say it has 7 beds but only put 2. There’s also a lot type generic on which you can build whatever you like without being tied to certain rules. It’s very easy to build on a community lot now. If you switch to build mode, it opens the lot your active Sim is currently on. If it’s not your lot, you can use as much money as you like. You can’t use this to cheat money though since stuff sold doesn’t give you any money and you can’t put it in your family inventory either. For people that are always out of money, there’s still the motherlode cheat though. Most of the common objects that we know from Sims 1-3 can also be found in Sims 4 but there are also new things like a tea cooker and a cupcake machine. On the other hand the trash compactor and the dishwasher are missing. It’s easy to feel right at home in live mode. There are new interactions of course and it looks different but it was more like testing an Add-On when it comes to the way Sims 4 feels. The GUI is different and so is traveling and the neighborhoods but it’s quite easy to find your way around fast. As mentioned in my Gamescom preview from 2013 multitasking and animation are new main aspects of the game. There are a lot of new animations and it’s funny to look on how Sims walk. All is very fluent although there’s the price of clipping and Sims within Sims to pay for that. It’s unclear if this will be fixed before release but I doubt it. Multitasking is automatically recognized by the game and actions that are compatible with each ‘fall’ into the existing queue to be executed simultaneously. There are certain pre-conditions that have to be met for that sometimes. My Sims was able to cook and watch TV at the same time but only if the TV hung over the stove. The same goes for using the toilet. On the other hand my Sim couldn’t take a bath and watch TV at all. Sims have aspiration (comparable to the lifetime wishes), whims, needs, moodlets and traits. Unlike Sims 3 aspirations can be changed any time you want. This can either be done through CAS (Plan Outfit) or in the menu in the lower right corner. 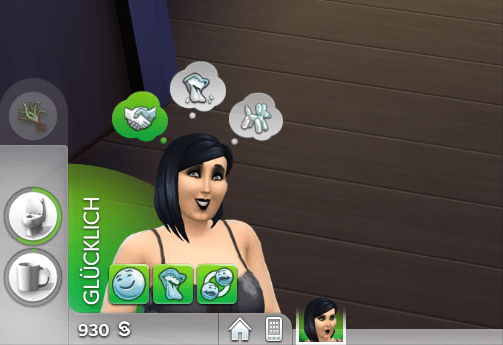 Whims, which are like wishes, show as speech bubble over the portrait of the Sim and can either depend on your emotion (colored) or be associated with your trait or the overall current situation. Moodlets directly influence your Sims emotion. 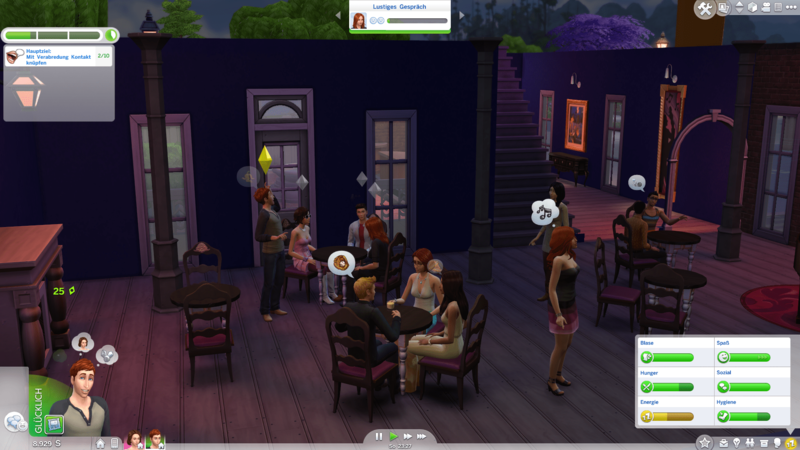 The needs are the same as they were in Sims 3: Bladder, fun, hunger, social, energy and hygiene. 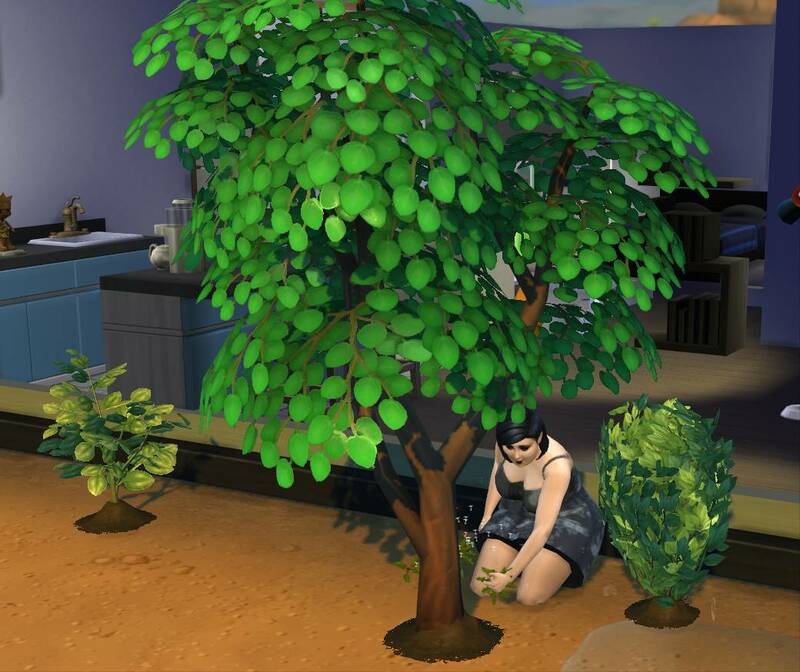 Traits can be set in CAS but you’ll also get one through your aspiration and if you do (or not do) a certain action for quite some time, you can gain one. My Sim became a loner since she didn’t interact with anyone for 24 hours. Sorry, this is not true. It was an achievement she got. I leave it up to you to find out what can be found where. There’s still butterflies in the neighborhood and I also saw a bumble bee but you can’t collect those anymore. If you have at least two frogs in your inventory, you can breed them and sell them for good money. Plants can now be planted in plant tubs or plots or you can simply plant them on the ground. Seeds and fruits can be found throughout the neighborhoods or you can buy them on the plot or the computer. Sims can learn different skills. They reach the first level immediately once they start doing an interaction that increases the skill. This is on purposes since the devs wanted to have the player see what kind of skills their Sims can have right away. Ingredients for cooking can be planted or you can just buy it on the fridge. There’s three different meal sizes now: Single portion, family portion (4 portions) and party portion (8 portions). Food still goes bad over time and a count-down shows how long it will be until it spoils. Books can be bought directly on the bookshelf and there’s a nifty option to tell your Sim to put away all books that are lying around the house cause Sims still leave them lying around everywhere. There are may more skills and hobbies but I didn’t have the time to try them all out. There’s almost no hidden skills as we were told at the presentation. 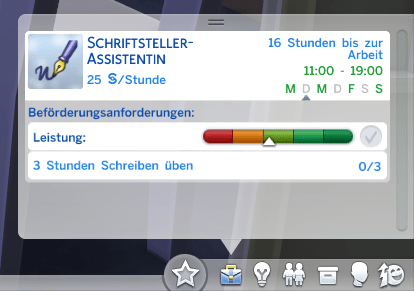 Like in the predecessors Sims can have a job. The choice of careers is rather limited but in Sims 4 there are many possibilities to make money. So you don’t have to have a regular job. You can search for a job through your phone or the computer since their are neither newspapers nor rabbitholes. All jobs are always available to choose from. You can see your Sims hours, how much he earns and the current level in in the career menu in the lower right corner. You need to raise your performance to level up and you can do this in different ways (emotions can help with this of course). You can also do chores at home that will help you. Sims go to work automatically by going to the closest street and then disappearing in thin air. There’s no maternity leave anymore and so your pregnant Sims and young mothers will go to work as usual. It’s up to the player to cancel work though and over a short period of time this is not an issue since you can raise your performance with other actions but you won’t earn any money. Sims 4 has 5 age groups: Babies, kids, teens, young adults, adults and elders. Babies are more objects without emotions that are tied to their cradles. Sims have two relationship bars. Once for friendship and one for romance and as I heard from others, you have to have both on high in order to get married. Woohoo has become a lot more casual because of this. 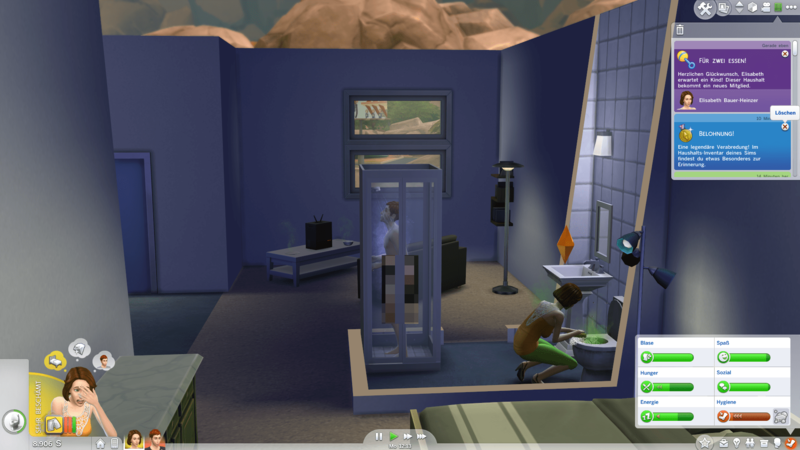 Sims that know each other well and have good relationship can use the bathroom together without one Sim having to shush the other out. The pregnancy last three days and my Sim was really sick really soon. You can take a pregnancy test after a while to be sure about what’s going on. The last trimester doesn’t have a fixed length and the child is born at home. 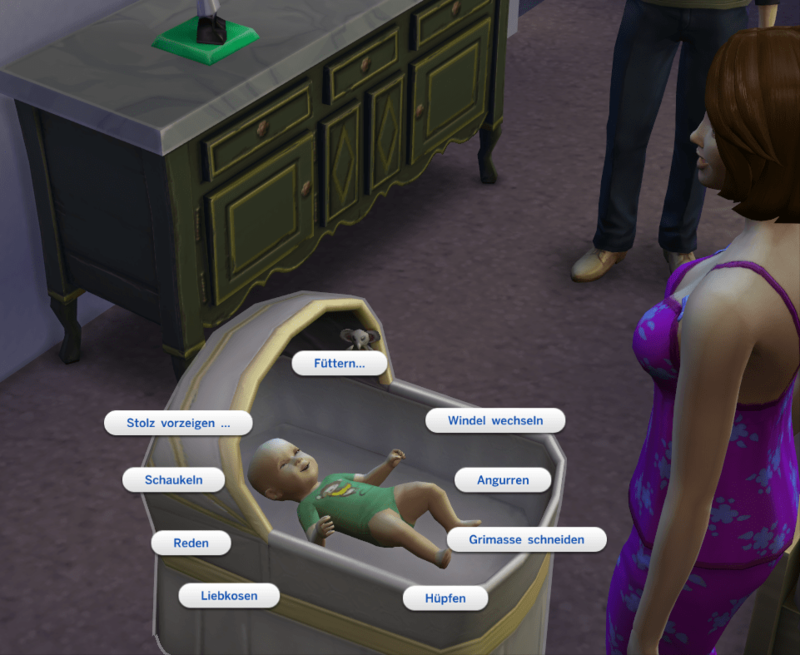 First the cradle appears, the sims spins around once and then has the baby in her arm. You can give your Sim baby a first and a last name and if you don’t wanna play it, you can age it directly to a child. The new play style with the half-open neighborhoods takes a bit of getting used to. The version we were able to play had to worlds (Oasis Spring and Willow Creek). Each world is divided into neighborhoods and a neighborhood consist of several lots and an open space where many Sims walk around. Sim can be engaged in conversations and it happens quite a lot that a random passing Sim joins it. 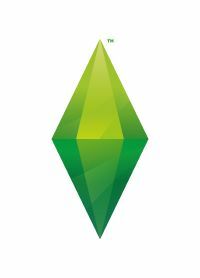 Sims which are engaging with each other are grouped together and are marked by a transparent plumbob. 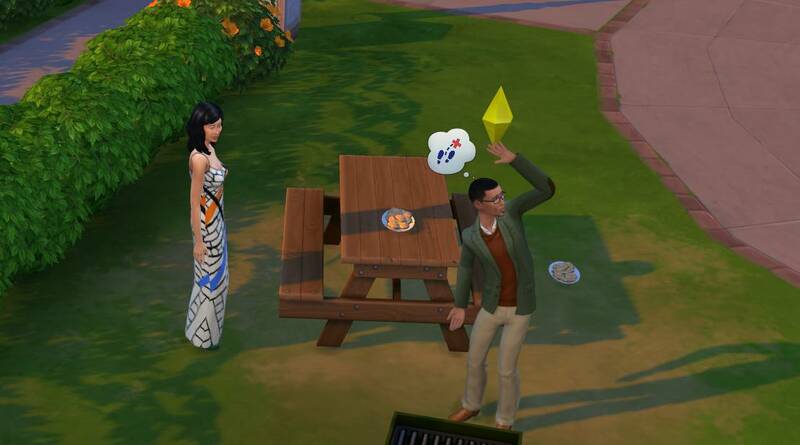 Your Sim can ask other Sims to join or leave a conversation. Each neighborhood has one open lot which you can enter and leave as you please. There’s a really short loading screen if you want to enter another lot or switch neighborhoods. You pick the lot you want to travel to through the new edit town mode which is now called Manage worlds. You can get to that view either through the phone, the option menu or by pressing the m key. Changing worlds happens through the same screen if you rather go there. You can travel alone, with another household member or with someone you know. Time goes on in all neighborhoods and the needs of inactive Sims change but they won’t plunge since Sims do take care of themselves. Inactives aren’t tied to one world. They can appear in any world they wish although the have the tendency to stick to their own. Every world also has a secret hidden lot which you can find. The hidden lot can’t be entered by inactive Sims autonomously. You will need to invite them with you. Traveling is always instant and can’t be queued or planned for a later time. Parties and dates now have goals and tasks which you can fulfill if you want. For each task you fulfill you get points and a medal. If you reach the gold medal, you’ll also get a free random object. The following types of parties were in the game. Parties can’t be planned for a certain time like in Sims 3 but happen instantaneously but you can now have a party at someone else’s house. The choice of service NPCs you can hire over the phone is rather limited. Besides a maid (once or permanent) and the pizza delivery there was not much to see. I didn’t see if you get a babysitter option once you have a baby. It’s rather difficult to find a conclusion for this game since there are actually two: One for players that have never played a Sims game before and one for those that have loved them for so long. I would recommend this game for every new player that likes the graphics style and this kind of games. It’s fun to watch your Sims and the game was really fluent and I only saw a few problems that weren’t game breaking. Some stuff that used to be really bothersome seemed to auto-correct themselves automatically. Buy/build mode is easy to use (well as far as I can tell) and since you don’t have anything to compare it to, the things that I really didn’t like will not bother you. The only thing that does come to mind are the length of some of the interactions but I’m pretty sure, they can be modded. It’s all a little different for Simmers that are used to Sims 1-3. I can only really compare it to Sims 3, since I stopped playing Sims 2 after the first expansion since 1.5 hours to load the game just didn’t cut it anymore for me and Sims 1 has been so long ago. A few things that were cut don’t bother me as much. Most of you know how much I want a pool and a diving board but I can wait. The same goes for toddlers. What bothers me most is the missing story progression. It’s something that probably can’t be modded in that easily or added later. Time will tell if I can get used to that. The small amount of service NPCs really irritates me and although I can understand the decision to make teens the same height as adults, I would have preferred less walkstyles if I could distinguish a teen from an adult instead. I found the difference to subtle in Sims 3 already and in Sims 4 it’s even worse. The choice of objects and CAS items is big enough for a base game but I also think they should have rather made a dishwasher and a trash compactor than a cup cake machine and a gigantic telescope. The controlling is either the same or really much easier but there are a few things that have become more complicated. A single Sim can no longer just move out over the phone and leave his family behind. Only the whole family can move this way. If you wanna split your family, you need to go to the Manage world screen and to it through there. To create a new Sim you will also have to go through that screen and it was a bit difficult to find. I could not find any other way. You can still change existing Sims through plan outfit. The game was running well on the Gamescom computers and I could find hardly any bugs, except for a crash when traveling and an invisible Sim which was visible again after re-loading. Keep in mind though that this were 3×2 hour play sessions with a new game each time. Sims still complain when they can’t go somewhere and also about their low needs but it was less obtrusive than in Sims 3. I will get this game although I have no clue how long it will fascinate me. I’m a bit concerned that it doesn’t have the potential to fascinate over an extended period of time but that depends directly on potential future Add-On and DLC plans about which Maxis still doesn’t talk. To be able to draw your own conclusions, I recommend getting the game through Origin itself. Origin has the Great Game Guarantee which allows you to give the game back withing 24h no questions asked. You an also do this if you want to buy the DVD since you can give it back after trying and then just get the DVD version instead.